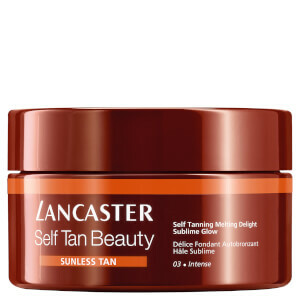 Recreate your summertime glow minus the harmful UV rays with the Self-Tanning Beautifying Jelly for Face and Body from Monaco-based premium skin and sun care brand, Lancaster; a light-textured moisturising formula that provides a progressive glow. Enriched with Tan Colour Adapt Technology, which combines a natural tanning agent with melanin, the formula delivers the nutritive benefits of Coconut Water Extract for a dual exfoliating and hydrating action. Harnessing the powers of Lancaster’s proprietary Tan Activator Complex and Antioxidant Complex, the bronzing gel works to stimulate melanin synthesis whilst shielding skin from environmental aggressors. Esfolie a pele suavemente antes da aplicação, para um resultado de bronzeado maravilhoso. Aplique com passagens suaves e uniformes. Repita a aplicação para aumentar a intensidade da cor. Passe um disco de algodão no contorno do couro cabeludo e nas sobrancelhas imediatamente após a aplicação. Use um toque mais leve nos tornozelos, nos joelhos e nos cotovelos. Lave bem as mãos depois de usar. Evite o contacto direto com a sua roupa. Aguarde alguns minutos antes de se vestir. Nota: não contém filtros solares nem providencia proteção solar.